Region: This beetle is found in the eastern portion of North America and is very common to the southeastern United States. Life cycle: One or two generations each year are common. Physical Description: The adult beetle varies in color, but is usually reddish orange to buff. They are shiny with a black head, a black band around the outer wing margin, and three or four black spots along the inner edge. They are 1/4 inch long and lay their eggs on the underside of leaves. The larva is white and slender. Feeding characteristics: The larvae are born in the root and nodules and sometimes the stem. 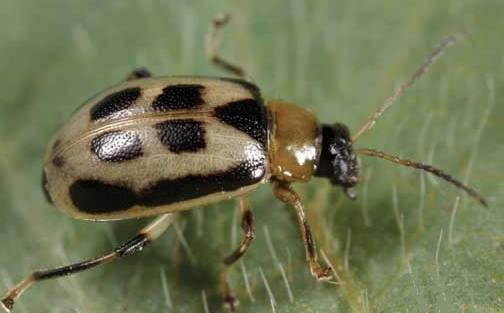 The adult beetle will feed on leaves throughout the summer, but it is seldom necessary to institute controls. Controls: If controls are needed, then rotenone or pyrethrum is used. Although, picking the beetles off the plants by hand usually will be sufficient control.